A Technology Enhanced Learning (TEL) ecosystem is a kind of Digital Ecosystem formed by independent platforms combined and used by learners to support their learning. 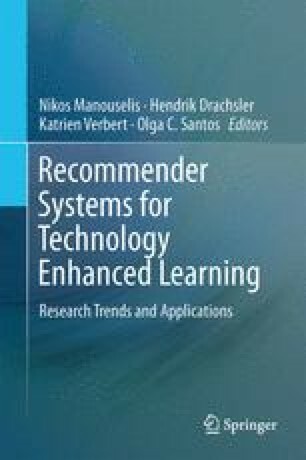 Related work shows that recommendations in TEL can support learners and that in TEL ecosystems, learners do use different platforms. We therefore pursue the goal to enable recommendations across different platforms by exploiting the synergies between them to benefit learners. However, building such cross-platform recommender systems poses new and unique technological challenges for developers. In this paper, we discuss the challenges faced and present a framework, with a running example, for the development of cross-platform recommender systems for TEL ecosystems. The framework decouples the development of the recommender system from the evolution of the specific platforms and allows the integration of different recommendation algorithms by combining graph-based algorithms. As proof of concept, the framework was effectively applied and evaluated to develop a cross-platform recommender system in a TEL ecosystem comprising Moodle as the Learning Management System, and MediaWiki customized as Learning Object Repository. For future work, the integration of different recommendation algorithms and a user study on the benefits of recommendations from different sources in a learning scenario is planned. This work was partially funded by the Argentinean Ministry of Science and Technology and the German Academic Exchange Service as part of the bi-national cooperation project “Semantic support for collaborative learning and knowledge management”.